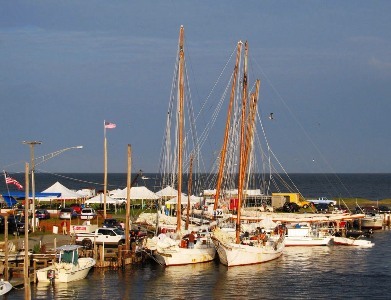 In Deal Island, Md skipjack sailboat races are a local tradition. The race is held annually over Labor Day weekend. Each year these beautiful wooden boats travel from around the Chesapeake Bay to compete, share stories, network, and celebrate these historic working vessels. A local Captain explained how difficult it is to maintain and operate these historic boats, saying: “Most of these boats are over 100 years old. When you take one out, anything can happen”. Although competition is fierce at times, when trouble occurs during races, crews are quick to work together. When a skipjack suddenly began taking on water during the 2011 race, A pump was quickly passed from another boat in order to control flooding while the boat returned to port. Before the race starts, skipjacks are on display for visitors to see up close. Accompanying the race, a festival features food, music, artwork, crafts, local authors, and other exhibits. During the race, boats compete in a closed course which is within sight of the festival. Sailing enthusiasts line up along the beach or tour the festival while the skipjacks compete. The skipjack races have been embraced by the community. For miles along the long road from route 13 to Deal Island, yard sales are held on the day of the race. As word spread locally down thru the years, more and more people began combining the race with yard sales. Eventually churches, non-profits, and small-scale entrepreneurs realized the potential and joined in, selling crafts, foods, and other items.